Get rid of piss ants at home: If ants are a menace in your home during the summers or rainy seasons, it is high time you took charge of the situation. These pesky insects can bite, damage property and plants and even invade your food. Pesticides are generally used to combat an infestation of piss ants, however, they can be toxic to not just the environment but also to you and your family. Thankfully, there are a number of natural and non-toxic means to get rid of piss ants as well as prevent them from marching back into your home. Without further ado, let us present to you the top remedies to get rid of piss ants. You are not the only being that dislikes cayenne pepper, piss ants don’t too! Cayenne pepper is hands down one of the most effective means of getting rid of piss ants. Sprinkle the area infested with piss ants with some powdered cayenne pepper. You can build a moat or wall to prevent these ants from re-entering your home before sprinkling the powder inside. You may also add the pepper to a bottle of water and spray it around infested areas. This will help you get rid of the piss ants and prevent them from making your home theirs again. A glass of lemon water makes a refreshing drink in summer. But, piss ants do not fancy lemon water. In fact, it acts as a great deterrent for ants. Simply make a solution of lemon juice and water and spray it on ant-infested areas. For quick results, do this a few times a day. You can also cut small pieces of lemon peels and scatter them around your patio and entrances to your lawn or deck to keep piss ants at bay. Vinegar is a very effective remedy in getting rid of ants. Make a solution of vinegar and water, and pour it over the path the ants traverse. The strong aroma of vinegar will act as a repellent to ants and you can be sure that they will never return. Dish soaps and detergents are loaded with chemicals that are no less than poison to piss ants. They dehydrate and break down ants’ exoskeleton which kills them in no time at all. To use dish soap to get rid of ants at home, make a solution of dish soap and water and spray it over infested areas and the trail that ants tend to take. Must read: How to get rid of sugar ants? This potent white powder that is made up of the fossilized remains of marine phytoplankton is yet another great remedy to kill piss ants. Diatomaceous Earth is also used to kill and repel other pests too, such as cockroaches and bed bugs. This powder attaches itself to the ants’ exoskeleton which leads to dehydration and kill them. Talcum powder is also said to be a good natural ant repellent. All you need to do is to locate where these little buggers are coming in from. Sprinkle some talcum powder, which will act as a firewall and keep the ants outside. Ants that are already inside your home will lose their scent trail, get lost and eventually meet their end. Must read: How to get rid of bed bugs? This potent herb is used in several remedies and works like a charm in keeping piss ants away. Sprinkling ground cinnamon in and around anthills can help get rid of piss ants. Alternatively, you can make a mixture of ground cinnamon or cinnamon oil with water and spray it on doors, floors and windowsills to effectively get rid of piss ants. You may also combine clove oil or ground clove with the mixture. The strong aroma that this combination emanates deters ants from coming into your home. Another way to use cinnamon oil is to dip a Q-tip in it and draw borders around everything that ants might get onto. Also check: How to get rid of carpenter bees? 8. Peppermint essential oil: This one is pretty similar to the cinnamon oil remedy. Peppermint oil possesses a very strong aroma that ants dislike. If poured around doors and windows, ants won’t cross these barriers ever again. Borax, combined with sugar and water and a little peanut butter, gets rid of any form of ant invasion. Ants find borax toxic, and will be killed upon ingesting it, thus making Borax an effective remedy to eliminate them from your garden and home. Alternatively, you may mix borax with food jelly and place it on a flat plate where ants frequent. You can also mix granulated sugar with borax in a 3:1 ratio. With enough water to make it syrupy paste, it should be placed wherever ants are seen. You will be surprised to see the ants drop dead in no time! Boil a kettle of water and pour it over ant hills. Ants will die immediately from the heat. You may repeat this every few days to eliminate the ants completely. This is an age old remedy that works like magic in eliminating ants from your home. Mix equal parts of powdered sugar and baking soda and either sprinkle or place small quantities of it in areas you expect ants to frequent. The sugar acts as a bait whereas the baking soda kills them. Spread small piles of cornmeal in strategic points through which you suspect the ants are creating entry into your home. Cornmeal is said to disrupt the digestive process of ants and they eventually die of starvation. Since ants are known to carry food back to their nest, they are bound to take the cornmeal back home too, which will eliminate more ants! Did you ever think that the flowerpot in your garden can come in handy in getting rid of piss ants? If you are fed up of being stung and attacked by ants in your yard, all you need to do is, to place flowerpot face down on an anthill and pour scalding hot water through the drain hole. An easy way to keep ants away from your pantry is to sprinkle a generous amount of flour at the rear end of your pantry shelves. Ants detest the odor of flour and will keep away from your groceries. If you find ants enjoying themselves on your patio or in your garden, you can use oranges to get rid of them! Puree a few orange peels and a cup of warm water and pour the solution over and into anthills. You will be surprised to see them all drop dead in no time at all! Now, this is a remedy you simply cannot go wrong with. 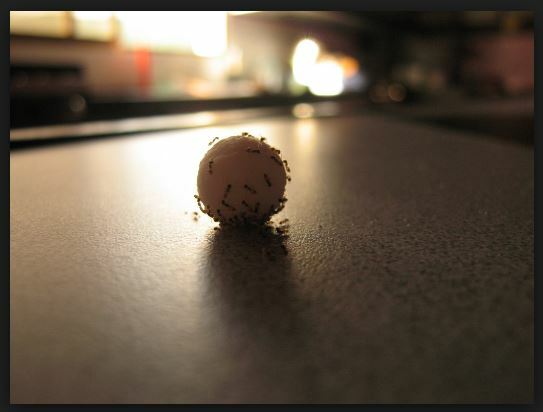 Waylay ants marching towards your home by sprinkling salt on their trail as well as the threshold of your home. Ants will steer clear from crossing the line of salt. Ants find sugar, flour and paprika appalling, so if you keep any of these essentials in your storage containers, you can easily deter ants from entering your home. Ants are naturally attracted to sweet foods like sugar-based foods. So, do not leave sugar-based foods out in the open. You can use this knowledge to create a sugar trap to catch ants. For instance, you can make some sweet jelly mixed with boric acid that is sure to kill any ants entering your home. Do not leave any dirty dishes in the sink. If you do so, you are only inviting ants to your home as they love feasting on leftovers. If you haven’t been doing it already, you should start clearing trash from your home every day. Pests are attracted to dirt and trash, so something as simple as emptying your trash can help keep your home spanking clean! These remedies have been tried and tested the world over. If you have ants at home that will not leave, try them and you will be surprised at how easily you could get rid of piss ants ad prevent them from coming back once and for all.